1/2 package of frozen hash browns or tater tots, or about three potatoes, boiled, cooled and diced. Prep Day: Trim excess fat from ribs; brown in oil. Place ribs in a deep 2 1/2- to 3-quart French casserole. Sauté onion in meat drippings, adding a little more oil if you need to; add water and bring to boil. Pour onion water over ribs; cover and bake for 2 hours, or until almost tender. Pour off juice into saucepan (better yet, remove beef bits with tongs, then pour liquid into a saucepan, then put beef bits back in casserole dish) and combine with sugar, flour, hot pepper sauce, mustard, vinegar, lemon juice, and bay leaf. Bring to boil, stirring constantly, and cook until all the bits are melted together and it’s a little thickened, but not like, actual gravy thickened. Season with salt and pepper; pour over ribs and bake, uncovered, for 1 hour or until meat is tender. Cool and place in a freezer bag. Freeze. Serve Day: Thaw. Heat oven to 325 F. Cook frozen/fresh potatoes in a skillet to get them nice and browned and crispy. 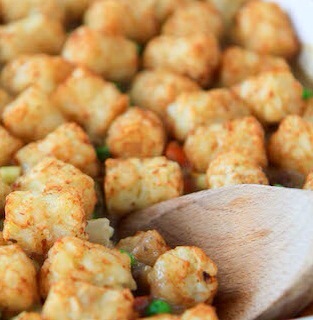 Dump meat mixture in casserole dish, mix in mixed vegetables, and put the potatoes on top. Drizzle well with white truffle oil, and bake in the oven for a half hour. Then remove, let cool for a second and serve!